Home NHL Rumors NHL Rumors: Pittsburgh Penguins – Do They Look To Clear Out Salary? Emily Kaplan and Chris Peters of ESPN: Looking at the keys to the Pittsburgh Penguins offseason. Consider seismic changes: Penguins GM Jim Rutherford is never afraid to make a big move. Sidney Crosby isn’t going anywhere and Evgeni Malkin has a NMC and is only going somewhere if he asks. Matt Murray, Jake Guentzel, Bryan Rust and Kris Letang are likely staying. A defenseman or two could be on the move, with Olli Maatta a possibility. Patric Hornqvist is on the decline but he carries a $5.3 million cap hit for four more years. Work things out with/for Phil Kessel: Trade rumors surrounding Phil Kessel will continue this offseason. If the Penguins decide to keep him, they need to figure how best to utilize him. Restock for the future: The core is aging there isn’t enough homegrown talent coming up. They are also short three draft picks this year (2nd, 3rd, and 6th) and a 2nd round pick next year. Do the Penguins look to move out some salaries? 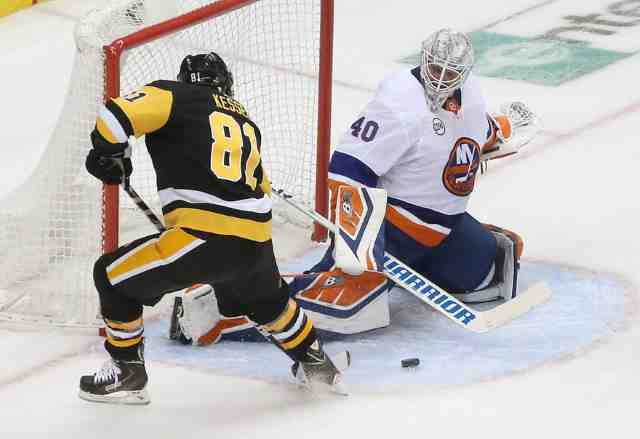 Jason Mackey of the Pittsburgh Post-Gazette: The Penguins only scored six goals in the four-game sweep by the NY Islanders. This offseason the Penguins could go the transition route, moving out some higher salaries and try to go younger and rebuild on the fly. GM Jim Rutherford should listen to trade offers on Phil Kessel. They need to move out some defensemen. Olli Maatta carries over a $4 million salary cap hit and could get some interest. If the Penguins prefer right-handed defenseman Erik Gudbranson, Maatta could be on the move. Forward Patric Hornqvist struggled since returning from this second concussion this season – his fifth since late 2014.